Ordinary Miracles & The Crazy 10: GIVEAWAY TIME AGAIN! I just came to the end of teaching my beginning photography class right now, and I'm loving this class so much. 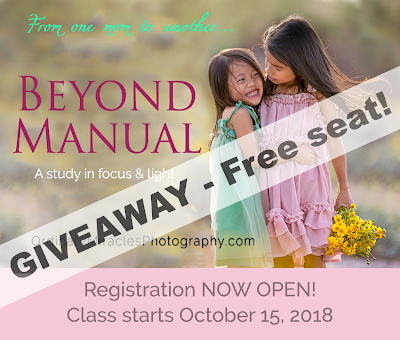 But I'm also looking forward to the next class, Beyond Manual, and so it's GIVEAWAY TIME AGAIN for a FREE SEAT in this upcoming class that starts on October 15th! If you're already shooting in Manual mode, but want to learn more about light and focus, this is a fabulous class for you. There is SO much great information on focus in this class, so if you'd like to nail your focus and get crisp sharp photographs, this is the class for you! But that's not all! If you like to learn about light and how to use it to your advantage, this is also the class for you! Beyond Manual is an intermediate class and does not instruct students how to shoot in Manual mode or cover the concepts relating to exposure. There are very few seats left in this class, and I do anticipate that it'll sell out quite soon. The details of the class are HERE, and if you have any questions about it, please don't hesitate to contact me. I'll announce the winner on my Facebook and Instagram pages in a week's time.Fingers are crossed for you!